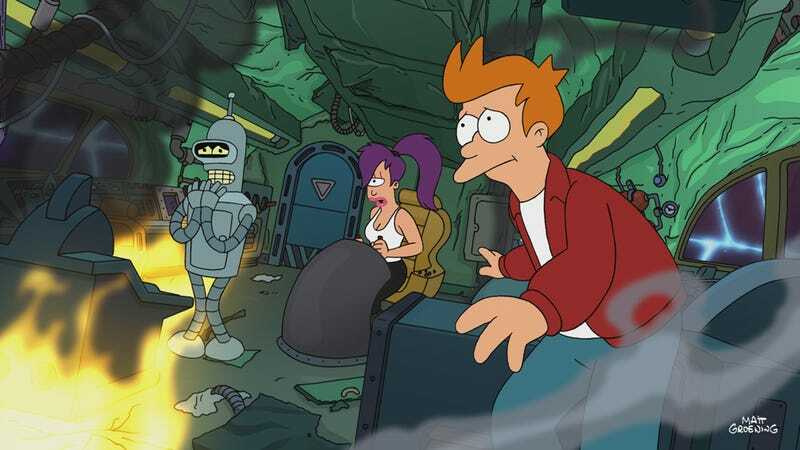 This Week's TV: Good News, Everyone: Futurama is back! In this week's TV, Futurama returns with a full hour of insanity. And Legend of Korra reaches its intense conclusion. You'll never guess which show is doing a body-swapping episode! Also, Lumpy Space Princess is writing a tell-all book, the Red Hulk is on a rampage, and there's a startling loss. Meanwhile, Syfy's latest TV movie may finally represent too great a departure from traditional storytelling logic as we know it — as John Connor fights giant earthquake spiders! Check out loads of clips and details below. This is pretty much the episode we've all been waiting for. Don't believe me? Watch the clip at left, and read this synopsis: "In order to do research for her tell-all memoir about men, Lumpy Space Princess goes undercover working for Finn & Jake." That's followed by Regular Show, Annoying Orange and Mad. This sounds like an especially fun episode, since we get to see Colin Ferguson stretch his comedy muscles again. In "Smarter Carter," "Allison's brother visits to meet her new husband; Carter's intelligence mysteriously begins to grow exponentially." Check out a sneak peek! A night out at the Dal goes awry when an insane trickster spikes the beer with a substance that transfers Bo out of her body – resulting in a ripple effect that finds our regulars inhabiting the skin of their friends, lovers and rivals. Yep, it's the traditional body-swapping episode! And here's a clip where the Lizard from Amazing Spider-Man attacks an auto repair shop. Excellent use of fish-eye lens! Nothing else on tonight, so we might as well highlight this show, which is having a crucial episode, with "Space Ship." Luca finds out the girls' secret, as you can see in the clip at left. And still there's no message from their homeworld, Lumina. And meanwhile, Brandon's parents' long-missing boat turns up in the middle of a cane field, miles from the ocean. Also on TV tonight: At 9 PM, Travel has a new Mysteries at the Museum. There's also the season finale of United Stats of America on History at 11 PM. Justin Hammer's dangerous actions escalate as he sends Titanium Man after his former subordinates and creates a poisonous zombie gas. "The Bots and the Bees": "Bender's son Ben is born - however, due to his mother not having arms, he lacks his father's talent in bending. After drinking too much Slurm Loco, Fry starts glowing." "A Farewell To Arms": The crew discovers a Martian calendar predicting that the world is going to end in 3012. Indeed, typical end-of-the-world things begin happening. Because electrical power has ceased to exist on Earth, Zapp and Kif have to use a pyramid spaceship left on the planet by the ancient Martians that runs on snakes. A Fry and Leela prom takes place. This week's big question: "What makes us who we are?" What is it that gives each one of us a unique identity? As we move through life, our outer appearances transform almost entirely. Our opinions and ideas change. And yet we carry our overall identities our whole lives. Are we all born with a core sense of self or can our identities be altered by our experiences? Scientists are probing into our brains to find out. Also on TV tonight: A brand new Johnny Test on Cartoon Network at 7:30 PM, and a brand new Alien Surf Girls on Teennick at 8:30 PM. This reinvention of the classic Dragon Ball episodes continues, with "Collapse From Within." You have to love any show with a synopsis involving "Vegeta-Baby moving his followers to the new planet." That's followed by a brand new Monsuno at 8:30. In "Blackout," there's a super-powerful drill controlled by the Occupation, and it's threatening to destroy the entire Grid — unless Beck can stop it. Using, presumably, two turntables and a microphone. That's followed at 9:30 PM by a new episode of the dystopian cartoon Motorcity. Now that Charlie's hand has moved a bit, Alex has high hopes for his recovery, and even considers taking time off from her job to look after him more. But meanwhile, she treats a patient who has multiple surgeries under his belt, but who keeps getting sick. And Charlie coaches a man who's been killed in a roofing accident, who has unfinished business with his surviving brother, who's severely injured and needs a transplant from the dead brother. Oh, and check out a preview, in which Alex strips down to her bra to try and get Charlie out of his coma, and meanwhile the devotion to lens flare continues. Also on TV tonight: There's — wait for it — a brand new Alien Surf Girls on Teennick at 9 PM. And a brand new Burn Notice on USA at 9 PM. In the season finale, we trace the line of descent from water wheels to mega jets. "Sipping with the Enemy" - Candace tries to bust Phineas and Ferb when they put on an enormous backyard magic show, while Vanessa and Major Monogram's son Monty get coffee together despite their warring fathers. Meanwhile, Dr. Doofenshmirtz tries to become hip in an attempt to get youthful followers. "Tri-State Treasure: Boot of Secrets" - Phineas and Ferb help their father unearth a missing piece of Danville history when they run into his lifelong nemesis, Worthington, at a flea market. Meanwhile, Dr. Doofenshmirtz makes himself younger to win a children's film festival. It's the two-part season finale, "Skeletons in the Closet/Endgame." The final battle is upon us! There's no actual description of these episodes online, but at least there's a promo showcasing some pretty intense destruction. In Arachnoquake, starring Tracey Gold (Growing Pains), massive earthquakes unleash giant albino spiders. Freed from their ancient subterranean prison, the spiders go on a murderous rampage through New Orleans. Joining Gold will be Bug Hall (The Little Rascals), Ethan Phillips (Star Trek: Voyager) and Edward Furlong (Terminator 2: Judgment Day). Admit it, this is your new favorite movie. Also on TV tonight: A brand new Kaijudo: Legend of the Duel Masters on The Hub at 8 PM. In Ultimate Spider-Man, Harry and Norman Osborne square off against Venom. And then in Avengers: Earth's Mightiest Heroes, S.H.I.E.L.D. faces off against the Red Hulk while the Avengers search for Bruce Banner and try to discover the Red Hulk's identity. The unit moves into an airport hanger, but the relocation could cause health problems. Elsewhere, the renegade Berserkers scheme to cast out Tom; the unit copes with a loss; an enigmatic visitor provides hope. The search for Debbie Pelt becomes official when her parents come to Bon Temps to ask Andy to look for her, but Sookie is afraid of what they-and Alcide-might find out. Meanwhile, Roman mulls Bill and Eric's proposal to do away with Russell Edgington, though Salome has her own separate vetting process; and Jason has an uneasy reunion with an influential teacher from high school. Also on TV tonight: There's the season opener of Aqua Teen Hunger Force at midnight on Adult Swim, followed by a new Metalocalpyse at 12:15 AM.